The first rule of thumb when repainting a large surface is to make sure you remove any existing paint. Not only will this allow for better adhesion of new paint, it will also improve the look of your paint job. While the project may require the use of wire brushes, scrapers and putty knives, you may find that the best way to remove stubborn paint is with acid or an acid-based product. 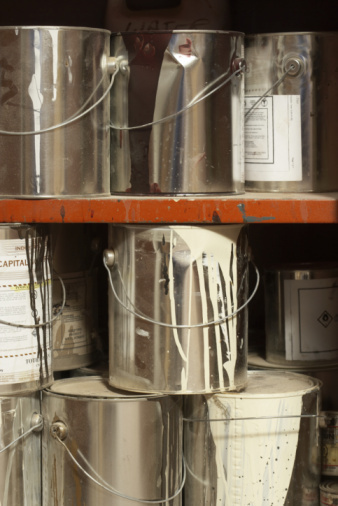 Many paint removers contain acids to help break down paint. There are several different types of paint strippers available on the market. Most common paint removers use a strong solvent such as methchloride or toluene to remove paint and varnish. These products can be extremely flammable in addition to having toxic fumes. You can, however, purchase paint stripper with acid as an active ingredient. Many paint removers on the market have a citric-acid base. While citric acid is environmentally friendly, it is also very slow-acting. When working with these paint removers, you may have to leave the product on overnight just to remove one coat. Another common acid found in paint remover is adipic acid, an organic compound with the formula (CH2)4(COOH)2. It is stronger than citric acid but also works slowly. Glutamic acid, which is actually an amino acid like that produced in your body, will help remove paint when combined with the other ingredients in paint remover. For surfaces like brick and cement, hydrochloric acid is a common ingredient used to remove old paint. Commonly sold as muriatic acid, this is a strong compound that works well on hard surfaces. It's recommended that you dilute the muriatic acid in a proportion of four-parts water to one-part acid. When using muriatic acid, be sure to have baking soda available in case the acid is spilled. Baking soda is a strong alkaline and will act to neutralize the acid. Although muriatic acid works well on cement, the surface should be washed thoroughly, since any residual acid can actually weaken mortar. Muriatic acid can also be used to remove paint from wood. Because it does not react with wood, it will only target the paint or lacquer. You should not use muriatic acid to remove paint from anything that is metal. While it will remove paint very well, its strength will tend to make the metal brittle no matter how well it is rinsed. Exercise caution when working with muriatic acid, and do not let it touch your skin. Wear rubber gloves and a mask when working.